Our beautiful Traditional Wall-mounted Patent Plaques feature the first page of your patent reproduced on the presentation plate in amazing detail making for a uniquely framed patent certificate. The presentation plate comes in silver or gold and is mounted on your choice of Walnut, Oak, Cherry or Black satin stain finish. 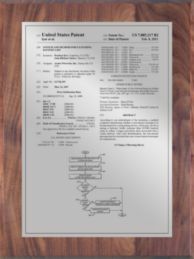 Each solid wood plaque is hand polished to bring out the natural beauty of the wood and accentuate your hard-earned patent.These patent awards feature a keyhole on the back of the recognition plaque for easy wall hanging. 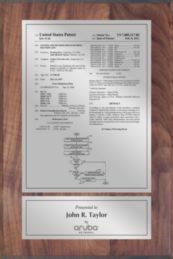 Each of our traditional patent plaques are custom-made to order, so if you don't see what you are looking for please email an IP Award Specialist or call (800) 932-1662 ext. 1 to see how we can help you. Watch our video below to learn more about the Traditional Series Patent Plaques.